You will NOT need to make or upload a podcast or video to complete this thing, but this post should give you some idea of the tools available to do so; please take some time to explore these tools and think about how they might be useful to you. If you’re feeling brave, we do encourage you to try them out – even if it’s only for a brief screen capture or a video to introduce yourself. If you’d like to learn more about podcasting, there are still places available (at time of publishing) for the IT Learning Programme’s Podcasting for Education course on 10 November or Podcasting at Oxford FAQs course on 8 December. Making your own podcast or video can be fairly straightforward, and there are lots of free tools to make it easier and add bells and whistles. 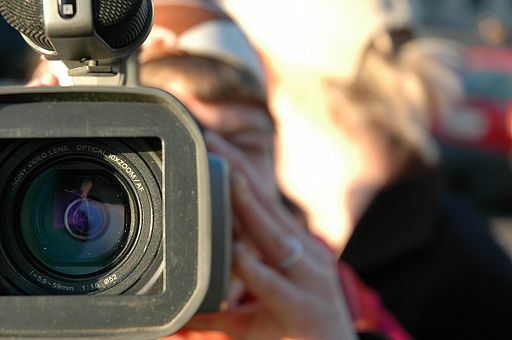 For now, we’ll deal separately with screencasts, which offer a video recording of action on a computer screen (with or without an audio track), and standard videos. Screen capture tools allow you to make a video, often narrated, showing how to do something on a computer. They record your mouse as well as everything you click on and show on your screen. Screen capture is a great way for showing students, colleagues or a wider audience how to use an online tool. There are a number of screencasting tools available, both free and for purchase. Many departments within the University use Adobe Captivate, which has some great features, but it isn’t free. It certainly isn’t necessary to spend lots of money to make a good screencast, however, and we’ll cover a couple free tools that do the job. 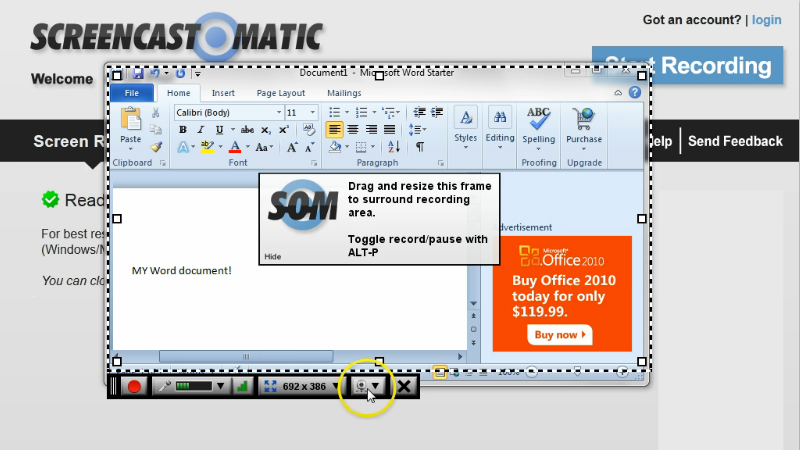 Screencast-o-matic is fairly intuitive, so you can get started right away. You may want to create an account (so that you can store and keep track of your videos), and you can also watch a short demo that walks you through the recording steps. To begin, press ‘Start recording’ on the top right. A frame will appear (make sure Java is enabled – if this is an issue then you can download an app); you can drag and resize this frame to suit your needs, and you’ll also see some options for size, etc. Once you’re ready, simply press the red button and go. If you don’t want to record anything, make sure you mute your computer’s microphone (otherwise you’ll get a lot of white noise). You can download a free version of Jing. You will get a ‘Sun Launcher’ button on your screen. Hover over the sun and choose ‘Capture’. Click and drag to select a portion of your screen, and then release the mouse when you are happy with the image you have selected. From here, you can do two things: 1) take a still screenshot or 2) make a video. You can annotate your screenshots with text or arrows. When you’re happy with what you’ve done, click the ‘save’ button. If you want to make an audio podcast, you just need a relatively modern computer and a microphone. Many computers have built-in mics that will do the job, although you may find that investing in an external mic is worth it for the improved sound (use a USB mic designed for the job if you want to avoid extra purchases like an external sound card). You can use any standard tool on your computer to record your sound; Windows Sound Recorder on Windows is free, and many Macs come with Garageband. You can also download a free tool like Audacity, which will also give you tools to clean your recording up a bit (this can be useful if you’ve made any mistakes or want to piece together parts from different attempts). The JISC-funded Steeple project has a great tutorial on Audacity. If you want to do a video podcast, you’ll need a video camera. This could be a simple USB webcam or something more expensive; you can even use your smartphone. Again, you can use Windows Movie Maker or iMovie if you want to stick to free tools. You can put your video up on a video hosting site such as YouTube or Vimeo, and these are often the best place to start. Once you’ve uploaded a video there, it’s easy to grab a code snippet that allows you to embed your file in a blog, on WebLearn or on another website. If you’re in the University, you may want to take a look at IT Services’ guide to publishing your podcast. It gives guidance on using OXITEMS and RSS as well as what you need to keep in mind to be added to the University’s iTunes U page. This thing may require a lot of work, particularly if you haven’t used these tools before and want to give them a proper try. If you have used them, let us know what you thought and how they enhanced your research, teaching or other work. If you haven’t, explore them and let us know how you think you could use them. Please do upload sample of your videos, screen captures or podcasts – real examples are always welcome! Tag your post Thing 12. Where Facebook is explicitly geared towards personal use, LinkedIn and Academia.edu focus on professional connections. LinkedIn is the world’s largest professional network, and it allows you to build an online profile that features your experience and skills as well as to network with other users in a professional environment, so it provides a great way to connect with contacts from your work world. Academia.edu is essentially a sort ofLinkedIn focused on the academic world, so it provides improved features for things like listing publications. Also – going back to our discussions of online presence – LinkedIn and Academia.edu profiles tend to feature high in Google searches, so a well-constructed profile can be a great way to develop your online brand. You’re not required to set up an account on either network to finish Things 11 or 12, but we strongly recommend you do. You’ll need an account to explore many of the tools’ features, and it’s a good way to improve your professional presence online. Pick one (or sign up for both!) and set up an account. Getting an account on either tool is simple, and you can register from each tool’s home page. Make sure you fill in your profile fully. Think about the search terms you used in Thing 6 and whether you might like to include them here. Remember that these are professional networks, so your photo, taglines and activities should be those you’d be happy with employers and colleagues seeing. LinkedIn allows you to upload your CV straight into your account (with a chance to edit and format, of course! ), which offers an easy way to get all your job information in. Once you’ve signed up, try adding colleagues or other contacts. Successful social media use requires that you actively connect with people and give them something to interact with, rather than just setting up an account and leaving it. If you already have a profile but haven’t used it very much, you might think about these aspects next. You can use your email accounts to find ‘connections’. Don’t be worried about sending requests to contacts; it’s considered fairly normal. Try taking this a step further; rather than just sending a request to connect, send a message with a question or a message. LinkedIn offers groups, which allow you to join others based around a sector, place of work or other interest – for example, University of Oxford Alumni or those in this list of great groups for academics. You can also search for groups.LinkedIn also allows you to see who has viewed your profile, send private messages and give and ask for recommendation and skill endorsements. Academia.edu has less functionality, but it is geared towards academic activities. You can write update posts on your activities, upload papers and other documents which might include ‘grey’ literature such as conference papers as well as link to your journal articles. It can also tell you how many people have viewed your profile, what keywords they used to find you, and who is following your work. You can also follow the profiles of other scholars, which is useful to keep up to date with people’s publications. You may be interested in the Engage lunchtime course on academic profiles on Linkedin (sign up on the ITLP website). Many people find LinkedIn useful as a tool for job searching. Employers can post jobs but, more importantly, your profile can give you the opportunity to ‘sell’ yourself to potential employers. Having endorsements and recommendations can help. Try asking for a recommendation for your current or previous position. As we mentioned, feel free to talk about all of this week’s things in one post, as they lend themselves to comparison and discussion. Did you choose to use one tool over the other? Do you think these tools offer a good way to present your professional profile, or do you prefer something else (a website, blog, etc.)? If you use Facebook, do you feel that LinkedIn or Academia.edu are a suitable alternative space for professional activities, or do you find Facebook works just as well if not better for what you want to do? Where Facebook is explicitly geared towards personal use, LinkedIn and Academia.edu focus on professional connections. LinkedIn is the world’s largest professional network, and it allows you to build an online profile that features your experience and skills as well as to network with other users in a professional environment, so it provides a great way to connect with contacts from your work world. Academia.edu is essentially a sort of LinkedIn focused on the academic world, so it provides improved features for things like listing publications. Also – going back to our discussions of online presence – LinkedIn and Academia.edu profiles tend to feature high in Google searches, so a well-constructed profile can be a great way to develop your online brand. You’re not required to set up an account on either network to finish this thing, but we strongly recommend you do. You’ll need an account to explore many of the tools’ features, and it’s a good way to improve your professional presence online. Pick one (or sign up for both!) and set up an account. Getting an account on either tool is simple, and you can register from their home pages. Make sure you fill in your profile fully. Think about the search terms you used in Thing 6 and whether you might like to include them here. Remember that these are professional networks, so your photo, taglines and activities should be those you’d be happy with employers and colleagues seeing. LinkedIn allows you to upload your CV straight into your account (with a chance to edit and format, of course! ), which offers an easy way to get all your job information in. Once you’ve signed up, try adding colleagues or other contacts. Successful social media use requires that you actively connect with people and give them something to interact with, rather than just setting up an account and leaving it. If you already have a profile but haven’t used it very much, you might think about these aspects next. You can use your Twitter and email accounts to find ‘connections’. Don’t be worried about sending requests to contacts; it’s considered fairly normal. Try taking this a step further; rather than just sending a request to connect, send a message with a question or a message. LinkedIn offers groups, which allow you to join others based around a sector, place of work or other interest – for example, University of Oxford Alumni or those in this list of great groups for academics. You can also search for groups. LinkedIn also allows you to see who has viewed your profile, send private messages and give and ask for recommendation and skill endorsements.